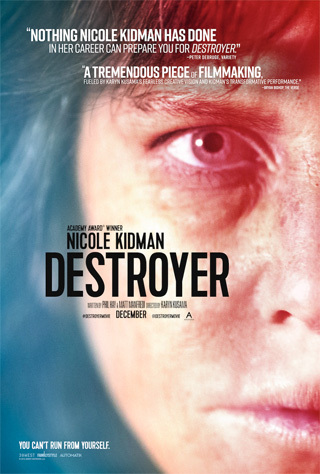 Destroyer is a bleak, sour, unforgiving story with an attention-grabbing performance by Nicole Kidman as a thoroughly compromised cop who commits crimes in order to cover up other crimes, with herself as the ultimate victim. In the putative debate over whether any movie released in, say, 2018 can qualify as film noir, Destroyer wears its hair shirt proudly. It's a full-fledged noir, completely suffused with gloom, with Kidman's Lt. Erin Bell suffering conspicuously from troubles of her own making for the entire running time. However, there's a slight problem with the screenplay by action-pic writers Matt Manfredi and Phil Hay, and also with Karyn (The Invitation) Kusama's direction. The film is haphazardly constructed with crisscrossing lines of action and reaction. Cause and effect are blurred, and the tangle of flashbacks creates timeline confusion. That's unfortunate because we really want to understand LAPD officer Erin's emotional turmoil, the one that's seemingly been sandblasted onto her face. Kidman is notorious for quirky characterizations, but Erin is a special case. As we piece it together from recurring flashbacks, Erin and her FBI counterpart Chris (Sebastian Stan) are initially assigned to go undercover to infiltrate a crew of bank robbers led by a deranged Manson-style cult figure named Silas (Toby Kebbell). The gang, which also includes certified losers Petra (Tatiana Maslany), Toby (James Jordan), and Arturo (Zach Villa), operates out of a desert hideout where cocaine, alcohol, and humiliation flow freely. Erin partakes. All this wreaks havoc with her already hectic personal life, which incorporates – amid more flashbacks – her flabbergasted ex-husband (Scoot McNairy) and her mixed-up teenage daughter (Jade Pettyjohn). The film's tempo upsets its narrative thrust. Erin seems to be reacting to things that might have happened offscreen, rather than directly. And yet it's always intensely personal. Eventually, Erin blurs the line between vengeance and professional duty in her pursuit of Silas and his pals. It might be easier to ditch the linear approach and take the long view of Erin's ordeal. Kidman goes deeper into the depths than normal in this role, ruining her looks in order to cast a spell of doom. Everything about Erin – her attitude, her eyes, the way clothes hang on her bony frame – proclaims "toxic." It's a remarkable transformation. How and for what reason these things happen to Erin is almost immaterial. She's a walking vortex of misfortune and that's all we really need to know. Meanwhile, we're treated to a convincing argument that Los Angeles, with its forlorn freeways and the ever-popular L.A. River embankment, is indeed the world capital of noir (sorry, San Francisco). Theodore Shapiro's music score reinforces that idea with help from the supporting cast, particularly Kebbell and Bradley Whitford as a supremely sleazy lawyer. The two bank jobs are briskly/brutally carried out, the neglected-daughter subplot drops intriguing hints about itself, and above all, Kidman's Erin Bell is a sort of Sphinx. To observe her is to be enchanted and repelled in almost equal measure. Take Destroyer with a grain of salt and put it into a bent-cop rotation alongside Rampart, End of Watch, and To Live and Die in L.A.